After the long days of summer, many parents look forward to their children’s return to school. Unfortunately, preparing for the return to school often includes a large financial outlay for back to school supplies and clothes. However, there are several strategies you can employ to limit how much you have to spend. -In late July, try to obtain your child’s back to school supply list from the school. Scour the ads for great deals and look at sites like A Full Cup to learn which items you can get for free. It may take several weeks for all of the items on your child’s list to go on sale, which is why you want to start shopping in late July. I employed this strategy last year and got all of my son’s school supplies for $12, and I bought extra to give at Christmas too. 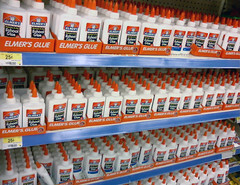 -Keep in mind that stores such as Staples, Office Depot and Office Max have a price matching policy. If you find a lower price at a competitor’s store, bring in the ad, and the store you are shopping at will match the price. You can save gas by taking advantage of this policy, but beware that most have a 7 to 14 day window for the competitor’s price, and a few stores exclude prices advertised on websites. -When you can obtain items for free, try to buy more than you need. Then, if your child runs out of some of the supplies mid-school year, you won’t have to pay full price to buy more. You can just shop in your supply you got for free. -Before going out to shop for clothes, first go through your child’s closet to see what clothing they already have that still fits and is in good condition. Make a list of items and colors so you can look for matching pieces when shopping. -Check out stores like Once Upon a Child. They often have new designer clothes for 1/3 to ½ the retail cost. -Buy on eBay. Many people list their children’s gently worn clothes on eBay, and you can find many auctions in late July and August. To make sure you get a good deal, read the description thoroughly. A good seller should specify how worn the clothes are and any flaws in the clothing. To make sure you are dealing with a good seller, check their feedback. It should be 100% positive. I never buy from a seller with lower than 98% positive feedback. Also, the more feedback a seller has, the more experienced they are. Finally, feel free to ask questions about the clothing before you bid on it. Consider buying several auctions from one seller who combines shipping to save on shipping costs. -Check out Craigslist. People often list their children’s clothes for sale and when they are having garage sales. You probably don’t want to buy all of your children’s clothes used, but you can find some high quality clothing at a fraction of the cost by considering used clothing markets. -Buy mix and match clothing. Try to buy 3 to 4 pairs of pants and 5 to 6 shirts that can be interchanged. This dramatically extends the variety of outfits your child can wear. -Stagger your buying. Buy some lightweight fall clothes early in the season, and buy sweaters and warmer clothes later in the fall. This can help you distribute the money that you spend over a few months. Wait for seasonal sales such as Columbus Day. Also, the stores frequently reduce the fall merchandise to make way for the winter items; try to buy more clothes when they are on clearance. The average American spends $600 on back to school shopping. You can reduce that amount by half or more by following some of these strategies. 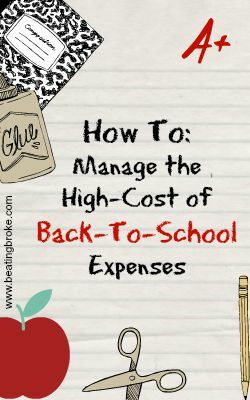 If you take the time to plan ahead and wait for the sales, you can dramatically cut your back-to-school expenses. Happy frugal shopping!